As I write this it is 3AM, a full moon shines down on a friendly sea and Lady Musgrave island light bears 345 at 10 miles. The Jolifou is at peace, Lyn and Silus sleep down below and we gently bob to the rhythm of nature’s will. We are currently traveling at 1 knot, nearing the end of the slowest planned crossing ever. Our stay in Bundaberg was much longer than planned as we awaited delivery of a new prop hub. 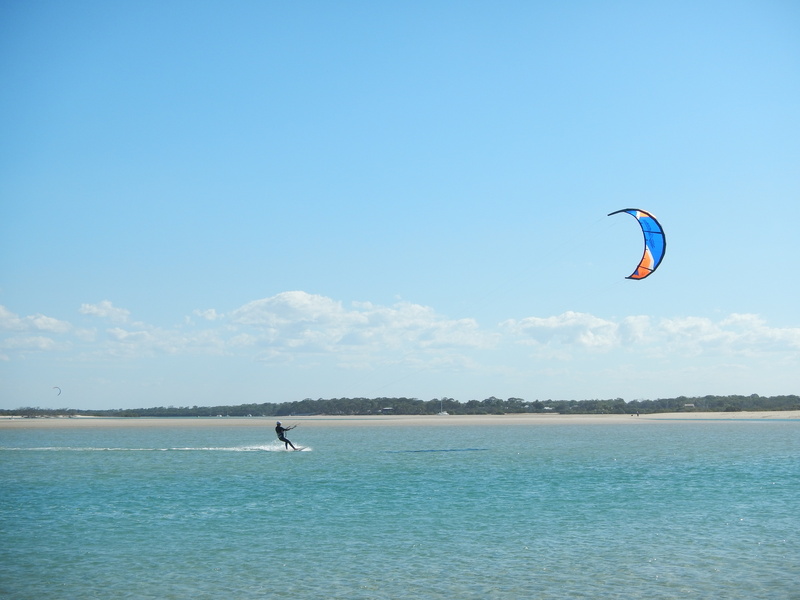 The stay was sweetened considerably by the generous loan of a car by our new friend Jarrod, which enabled us to do some shopping, stock up on food and alcohol and I was even able to get out to Elliot Heads for a kite-surf (a great spot for it). The enforced delay also meant we could catch up with Wendy and Rob of Aja who otherwise would have been out of town. After 4 days on the hardstand it was wonderful to be floating again this afternoon. With a forecast of nice moderate Easterlies for the night, becoming adverse Northerlies the next day, we were left with a quandary for our planned trip to Lady Musgrave. The distance is 50 nautical miles which, at our normal cruising speed of about 7 knots, we would do in 7 hours. You certainly don’t want to attempt entering the narrow un-lit reef pass at night, even with a full moon. Rather than risk having to motor for a long time against the wind the next day, we decided to go while the going was good, but sail really slowly so that we arrive in daylight. Another factor in the decision was that it would be a beautiful night to be at sea and we would enjoy a stunning sunset and moonrise. Which brings me to why we are currently doing just 1 knot. It was too hard to sail slow, making for an uncomfortable roll, so we went a little faster at about 5 knots, reaching with just a headsail. Now, within sight of the island we have hove to, which is basically the yacht equivalent of stopping without anchoring. You back the mostly furled headsail (or a small part of it) and sheet the mainsail (3rd reef at the moment) on hard, helm all the way over and the boat balances at 45 degrees to the wind and waves, drifting slowly forwards and sideways with a relatively comfortable motion over the waves. This is often used as a defense strategy in gales and big seas as the boat tends to ride the waves well like this. It’s the first time we’ve done it on Jolifou and so far I’m very pleased with the result. After a trip that gave us a stunning sunset, sunrise, full moon rise and set and whale sightings, the highlight for Lyn was the next morning when Silus did a poo on deck for the first time ever!?? This is a significant event in our efforts to turn him into a boat dog, as it takes a lot of adjusting for a dog to do this and is obviously important when you plan on spending many days at sea. The old dog is learning new tricks! 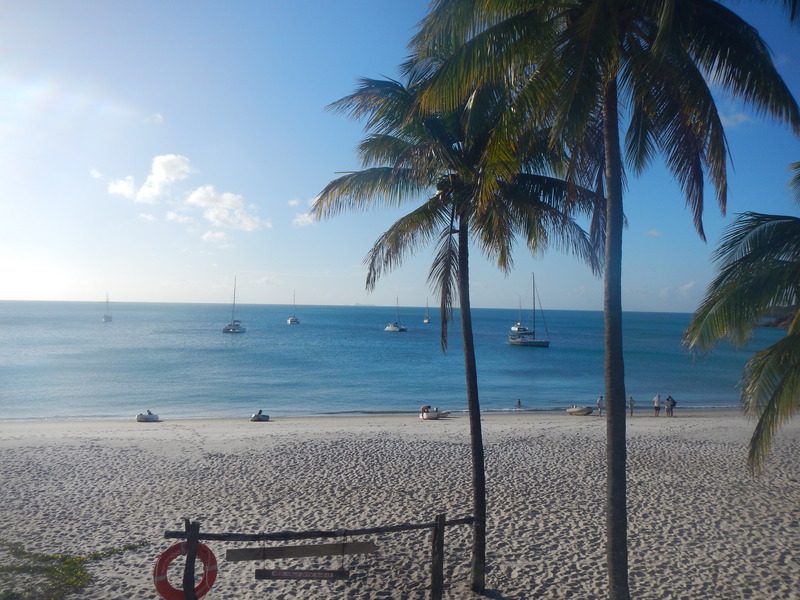 We timed our arrival at Lady Musgrave for the high tide and entered through the pass at about 9AM, which means we took about 17 hours to do 50 nautical miles = average speed of about 3 knots. The reef pass was pretty straight-forward with the sun a little up and the Maui Jim polarized sunnies on, it was very clear where the depth and shallow coral heads were. 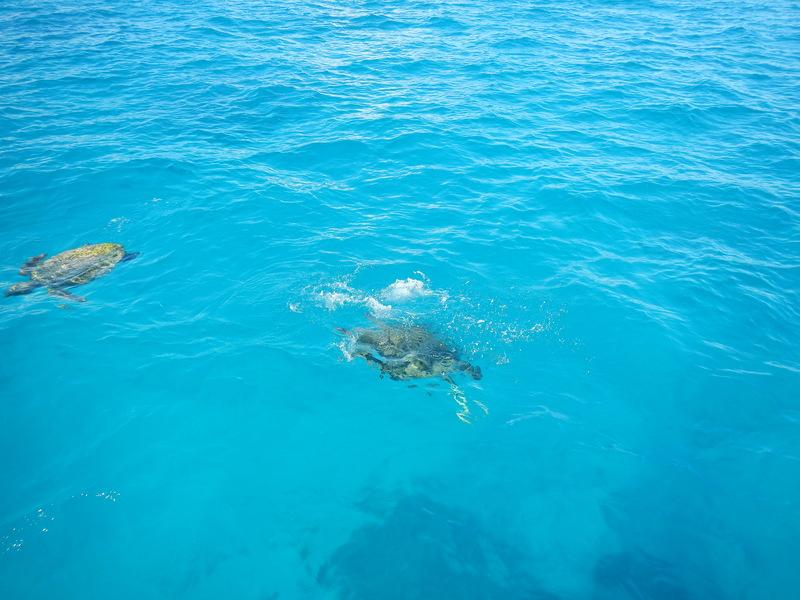 Lyn was delighted to be greeted by two huge green turtles as we entered the lagoon. After an initial failed attempt, the anchor set well and we were settled in one of the most beautiful locations on this planet. it is a place best visited at neap tides and calm weather, certainly you do not want to be trapped inside the lagoon on a stormy night at spring tides because if your anchor drags you always will land up on the sharp reef and you would never want to try to get out of the lagoon dodging coral bommies in the dark. As mentioned above there is a full moon at the moment, so it is indeed spring tides. 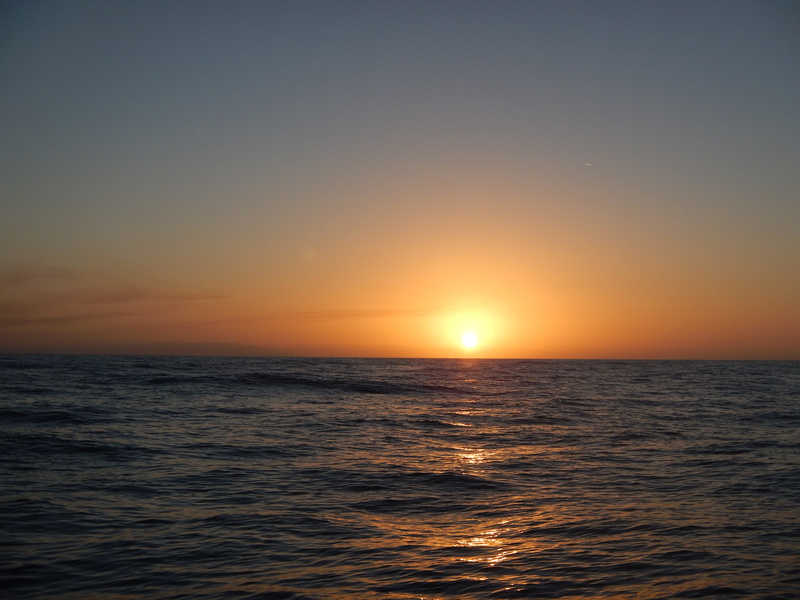 The weather is calm and the swell small, however, as per the forecast, and although we get a little bit of surge at high tide at low tide it is the calmest anchorage you could wish for. The beauty of this place is absolutely stunning. The water is clear and a mixture of shades of azure blue, green and yellow lie all around as you soak in the expansive 360 degree vistas. In the distance the waves thunder on the surrounding reef and closer by lies the pretty little cay, with white sand beaches and green trees. 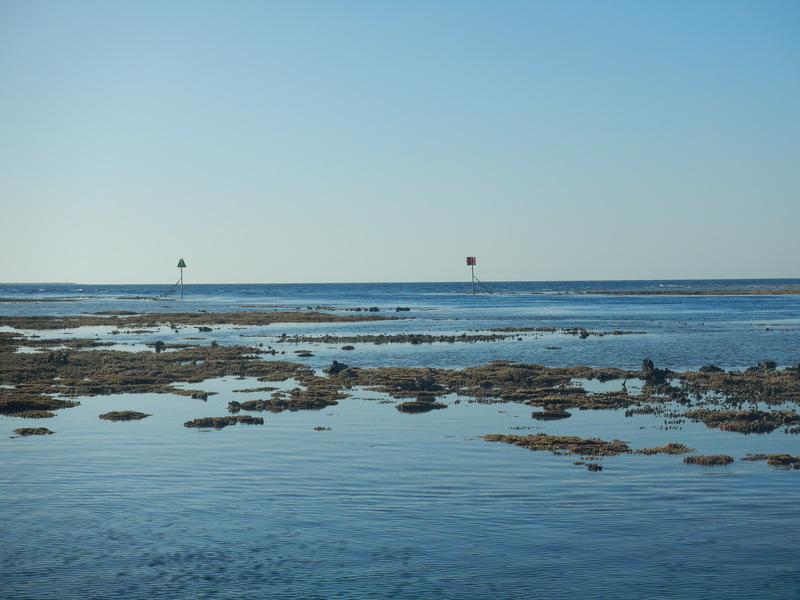 The lagoon is not deep everywhere, there are coral bommies and sections of reef scattered around, which dry at low tide and provide some interesting snorkeling. Yesterday we caught up with a little sleep before enjoying some snorkeling in the vicinity of the boat. Lyn and Silus took the stand-up board for a paddle to the other side of the lagoon and back, spotting a huge ray on the way. 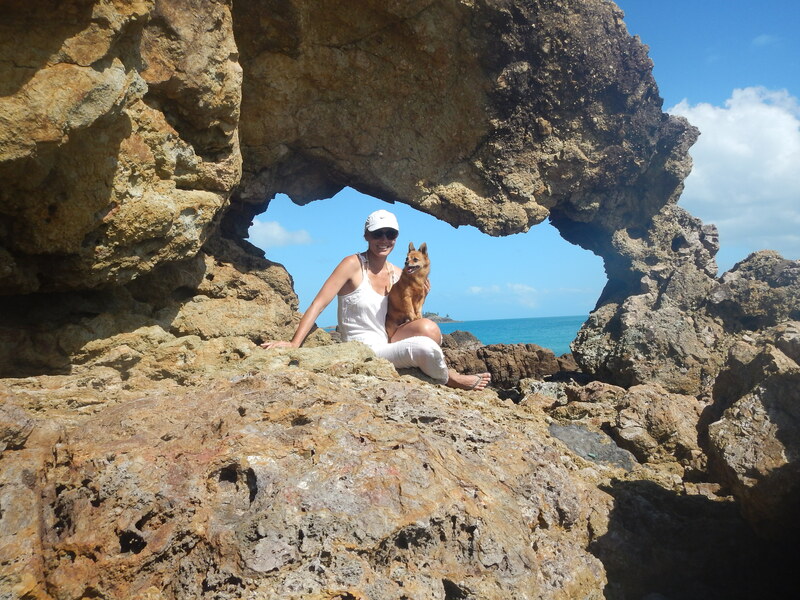 Today we took Silus to the beach on the cay and had a look around. The surrounding beach is beautiful and the interior is a wonderland of trees and birds. 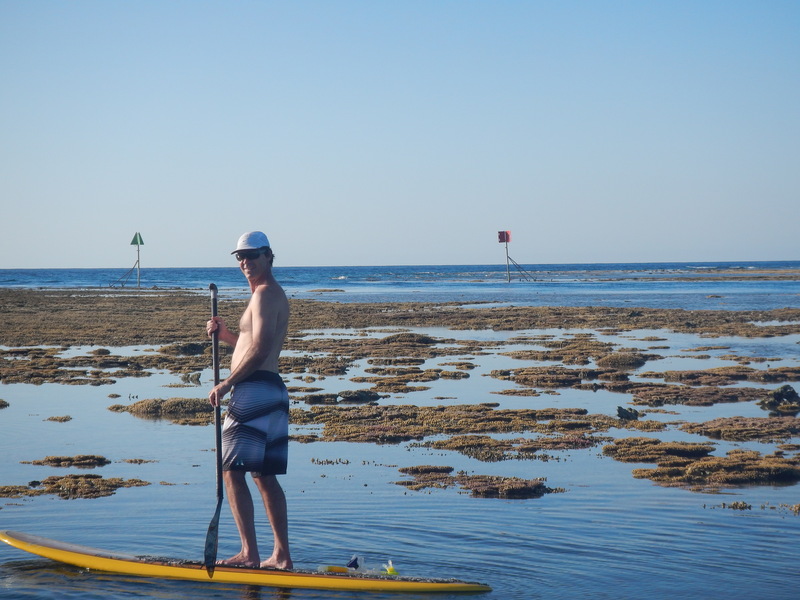 In the afternoon we paddled along the edge of the fringing reef, soaking up the beauty of the coral gardens. A new friend Craig, from a catamaran called Ocean Star came around for sun-downers. We are now anchored in West Bay, Middle Percy Island. 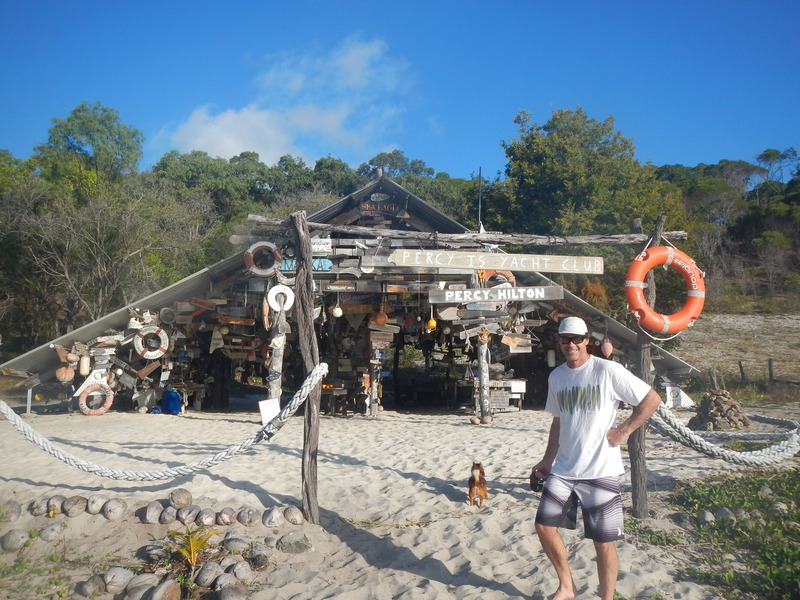 Believe it or not, this place actually tops Lady Musgrave! 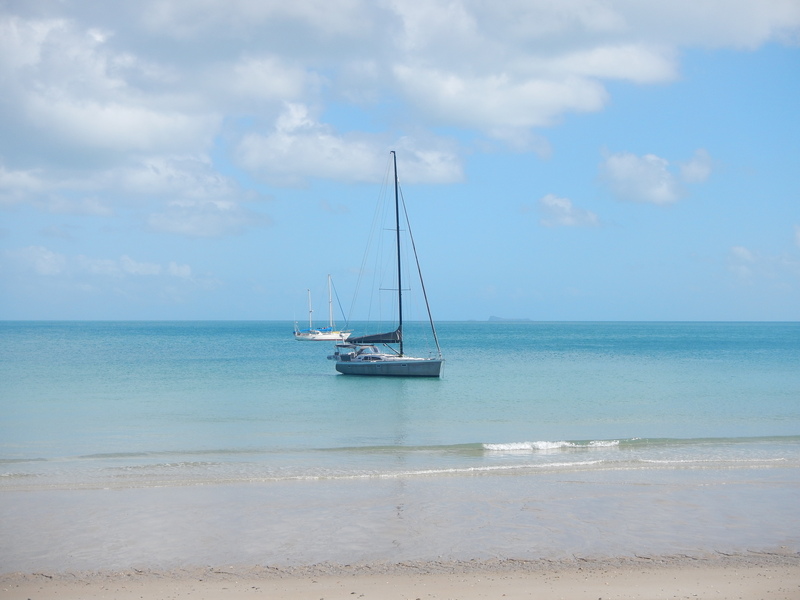 We left Lady Musgrave when the South Easter came through at about 9 AM. Whales outside the reef pass bid us a fond farewell to this special place and then it was sails up and motor off. This was our best passage so far with 12 to 18 knots of down-wind breeze all the way. Jib poled out to windward or leeward and no need for the annoying sound of the engine. We saw many whales, breaching and jumping out of the water, not too close though! 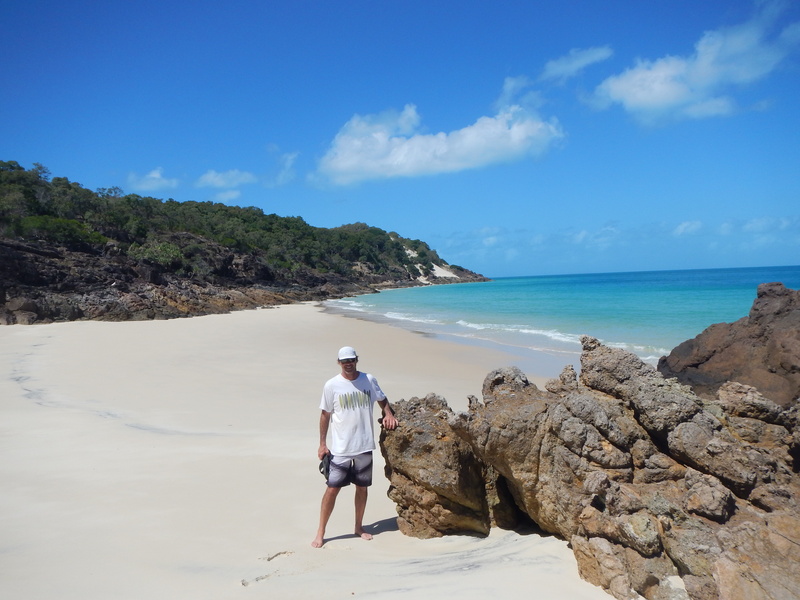 The trip was punctuated by passing by the beautiful islands of the Capricornia group and later other islands such as Tweed and High Peak. We hardly saw another vessel the whole way, just enjoyed our own ocean of champagne sailing. We arrived the following day at the Percy Isles. Rounding Hixson point we marveled at the beauty of the rocks and sea cliffs, then were greeted by the stunning West Bay where we anchored in really quite close to the beautiful white beach. West Bay is a small bay with a white sand beach between rocks on either side. No coral, just nice sand. There are palm trees at the top of the beach and in the middle is the charming and quirky “Percy Isles Yacht Club” shack. 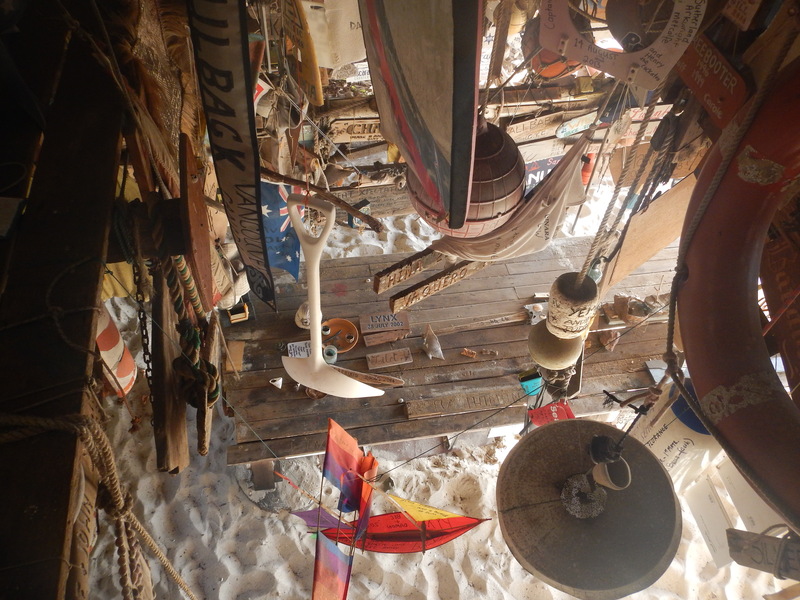 The “club” is an un-manned A-frame shack adorned everywhere with the names and memorabilia of the yachts that have visited. A big plus of this place is that Silus was able to legally go ashore which is unfortunately a rarity in the nanny state where the government feels that everything needs to be a national park that must be protected from little dogs. I’ve never seen him run so fast as when we let him free on that pristine white beach. A spontaneous gathering of the crews of the 6 or 7 yachts at anchor developed on the beach with drinks and snacks appearing miraculously. After a long, much-needed sleep, this morning we went exploring along the rocky coast-line South of the bay. The rock is amazing, with quite a few good looking climbing possibilities (for our rock-climbing friends). We were wearing thongs so despite the temptation we decided that it was best to be safe and didn’t bite, but we may yet go back with the climbing gear. We came across a beautiful white sand beach between the rocks and couldn’t resist a skinny dip! 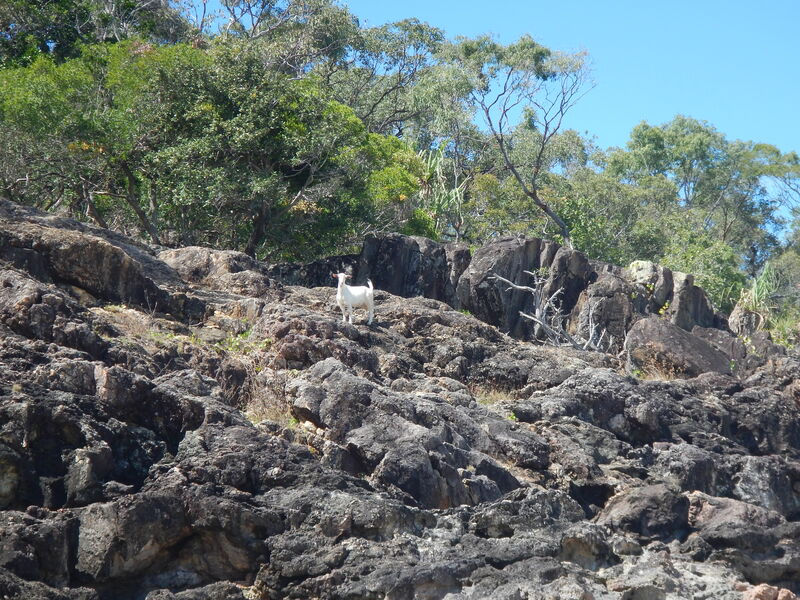 Further on we saw one of the resident goats, which Silus had to chase of course. We climbed some really steep sand dunes to the top and then looped back through the forest at the top of the cliffs. I think the legs will feel it later! This afternoon we are doing the walk up to the home-stead where we hope to buy fresh fruit and veg and honey which they make locally. We are told that you can get Telstra connection up there, so we are hoping to be able to post this blog if possible (we haven’t had connection for some days now). Our plan was to spend just the one day here, but we may well extend a bit because I can’t imagine the National Park islands to the North being better than this. By jolifou in Uncategorized on September 14, 2014 . Fantastic story Bruce!!! I really think you should compile all of these blogs and put them into book, get it published, and reap all the financial benefits!! I have bought quite a few books written by cruising sailors and your descriptions are far better than any I have read!!!!! Think seriously about this idea as you write so well……carry on having a wonderful, exciting, beautiful time. What a wonderful thing to do………so happy for all three of you on the JoliFou and well done to Silus!!! John, the vet, asked me to please post some pics of Silus on the boat…………must get his email address and do this!!!!!! Lots of love and hugs to the happy sailors. Enjoying your adventure. It might be a bit much for the Magic Puddin’ but it sure is enjoyable from the armchair. Hi to the 3 of you. We agree with Joliette! This is without a doubt the best cruising narrative we have encountered. We look forward to buying the book…..
Also loving the pictures and wishing we were sailing along side of you. Wow! This is fantastic! May you continue to have such amazing experiences and fantastic weather and may Silus continue to grow as a “Ship Dog” and poo whenever he needs to! Tons of love and hugs to you both! Hi Bel, market is on Saturday so we missed it 😦 and you won’t be here early enough next week! Bubbles, as much as you can carry, pretty expensive here! Thanks to all for your kind words. Joe, the prop issue was that the autoprop has a rubber bushing in the hub (as do all saildrive props). The bushing had delaminated from the bronze of the hub so the inside was spinning but the outer hub was not. Autoprop agent said they should be fully serviced every 5 years or so at the factory. The hub design has now been improved so you don’t fully lose drive if the bushing goes. They could not supply a replacement bushing, so upshot is we had to get a whole new hub of the new design. Ouch! Lyn, Bruce & Silus, I think you really are living your dream and this is only the 1st practise leg. I agree you write so well Bruce and the colour of the water, what can I say. Thanks Suzy, we have been thinking about you so much and are very happy to hear things are on the up and up! I too want a copy of the book when it comes out !!! Great blog guys. I have a question for you. 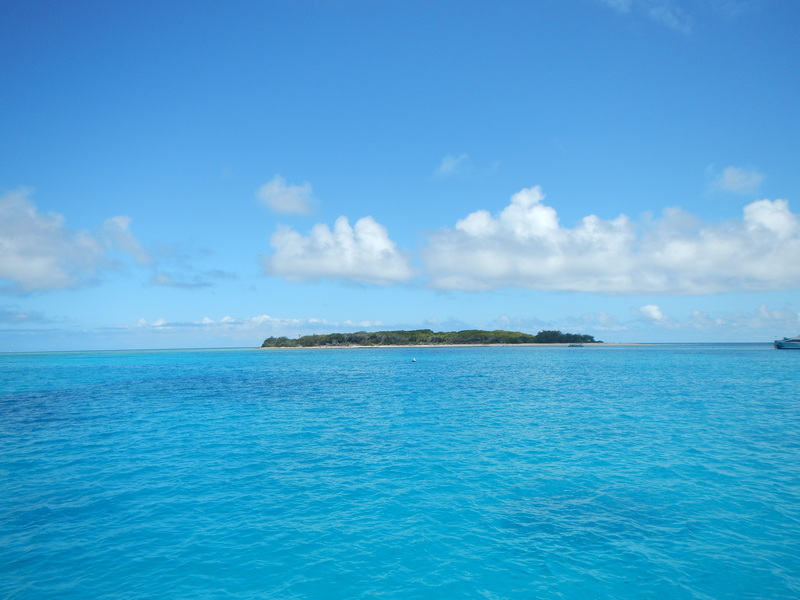 We’re starting a cruise boat from Town of 1770 to Lady Musgrave Island, and are looking for a great image to use. We found your image of Lady musgrave here and wanted to ask if we can reproduce it on our new website and credit/link back to your website. Our site is 1770reef.com.au and contact details info@gippslandweb.com.au .